Yoni Kami explores the idea of spirits as they relate to the female body. Drawing from both Hindu and Shinto texts, the pieces reference yoni, an all-encompassing Hindu word for the female reproductive system, and kami, the Shinto spirits believed to inhabit all things. 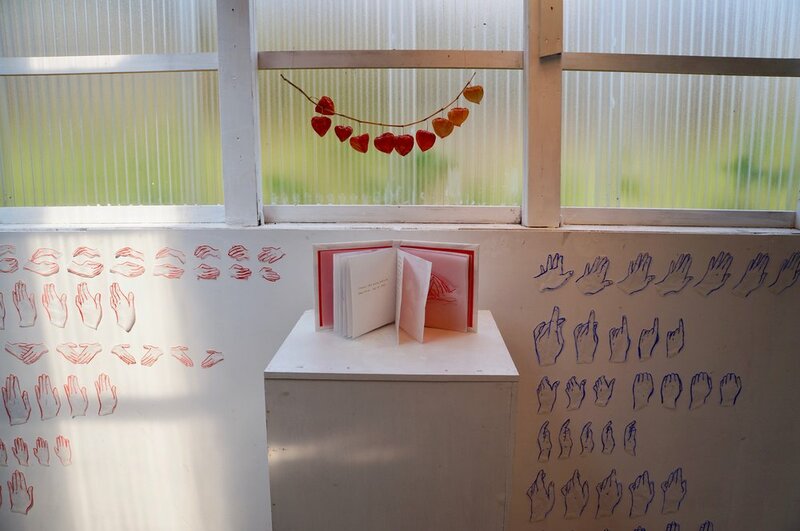 Displayed together, the handmade book and looped video support and reference one another, dancing between palpable, written concept and performative, alternate reality. Together they ask, what if our bodies had spirits that inhabited them? Would these spirits have memories of their own? In conversation with Yoni Kami, this moving painting explores the concept of body memory. Retracing the physical painting, the animated hand visually references the ways in which we replay and, sometimes painfully, relive physical experiences. 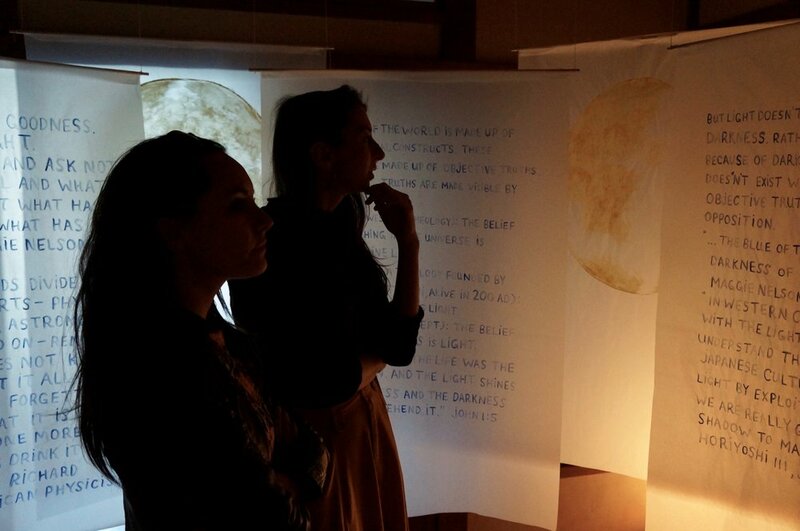 Using the cycles of the moon as a visual framework, this 16 piece installation explores the way in which lightness and darkness inform varying definitions of enlightenment. While the full moon represents belief systems based on the idea that divinity is light, the new moon represents belief systems based on the idea that divinity is nothingness, or darkness. Drawing from religious texts, auto-biographical and fictional prose, interviews and quotes, Divine Lightness / Divine Darkness leads the viewer through a sort of thesis, arguing a case for magic as choice. Inspired by the polarity between light and dark, this oracle deck explores the dichotomy between magical construct and enlightened nothingness. Each card draws visual and conceptual material from both natural phenomena and occult practice, blurring the line between science and mysticism. By shedding light on the precariousness of reality and our own constructed experience of it, this oracle deck encourages us to embrace the triviality of life as we know it. In this way, it uses the overwhelming idea of nothingness as a tool with which we can draw light out of dark, construct positivity out of negativity, and manifest acceptance, oneness, and magic as choice.